Hotel Gandharva by Peppermint with contemporary 42-rooms is strategically located at the city centre near the heritage walled city, next to the metro station, half a km to inter-state bus terminal, 2 km to railway station and 11 Kilometers from the International Airport. But in a quiet & serene colony Jobner Bagh station road Jaipur. Step outside and you will have an easy access to some of the city's most popular tourist attractions like Hawa Mahal 2km, City Palace 2km, Amer Fort 10km and local markets like Bapu Bazaar 2 km , Johari Bazaar 2km etc. The hotel has an added advantage of being in the proximity of major corporate hubs and convention centers. Renovation are always more complex when it comes to implementation of Green Building norms. 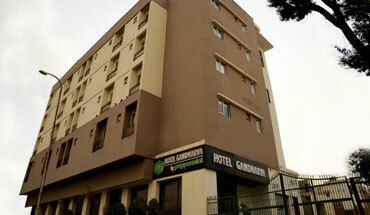 Hotel Gandharva by Peppermint is one such hotel. The project was converting an old property to completely renovated New Age Eco-Friendly Hotel. Entrenched in the cultural legacy of India's Pink City, Hotel Gandharva by Peppermint is the best combination of an upscale hotel experience and environment practices. Our hotel welcomes guests with refined elegance, contemporary amenities, and a prime location near Jaipur Railway Station & City Bus Stand. Guest comfort has been the priority; it has been kept in mind that it comes with other features such as provision of fresh air. This enables the in-house guest to avoid the sick building syndrome and also the spread of disease is controlled. The fresh air in the hotel is designed to be 30% over and above the ASHRAV 62.1 standard. Further the air quality is ensured by use of low VOC paints. Water is another major concern, especially in the State of Rajasthan. Keeping the IGBC norms in consideration and the estimated water usage - without compromising on guest comfort, low flow fixtures has been used in the hotel. This not only ensures that lesser water is consumed but also ensures that less energy is wasted on pumping and treating waste water. Energy is a major contributor in the expenditure of commercial facility. Also keeping in mind YE variable occupant load in the facility, a VRV system is proposed. This leads to less energy consumption resulting in lower operation costs hence providing exceptional guest facilities. Our rooms are designed with your comfort in mind, and feature luxury bedding, marble bathrooms, and high-speed Internet access. Enjoy all-day dining at our Multi-Cuisine Restaurant Crystal Lounge. And our unparalleled Jaipur location makes it easy for you to enjoy area attractions, including the famous like Hawa Mahal, City Palace and many more. Your India getaway awaits here at the Hotel Gandharva by Peppermint, Jaipur.